Have you tried voice broadcasting? It’s an automated phone call that’s an effective alternative to email. Marketing and Sales use voice broadcasts for appointment reminders, event promotion, customer surveys, and more. Learn how marketing and sales professionals are using intelligent voice broadcasts to cut costs, save time, and generate leads and revenue. 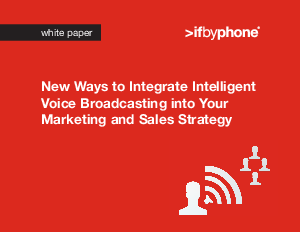 Get the inside scoop on specific use cases for intelligent voice broadcasting with this white paper.